M.A. Mortenson, one of America's most successful construction firms, is erecting a multi-purpose stadium in downtown Minneapolis. In order to facilitate management of its construction projects, Mortenson is using Aeris Enterprise, an innovative weather alerting software platform. Mortenson's ability to preview multiple weather models, days in advance - accurately identifying expected snow, rain, wind, and temperature (heat and cold) events - provides job supervisors the weather intelligence they need to save money on scheduling and operations, while taking job safety and risk management to the next level. We have a narrow window to complete work on the [football] stadium. Aeris Enterprise is helping us take advantage of every dry, suitable hour at the site between now and the summer of 2016. M.A. Mortenson was looking for a solution to take the guesswork out of future weather. Since weather plays a critical role in outdoor construction, worker safety, and job efficiency, they turned to AerisWeather to provide intuitive forecasting software and severe weather alerting. With Aeris Enterprise, users can access sophisticated mapping, displaying both current and future weather details for the locations and job sites that matter to them. This allows Mortenson to take full advantage of good weather, days in advance. 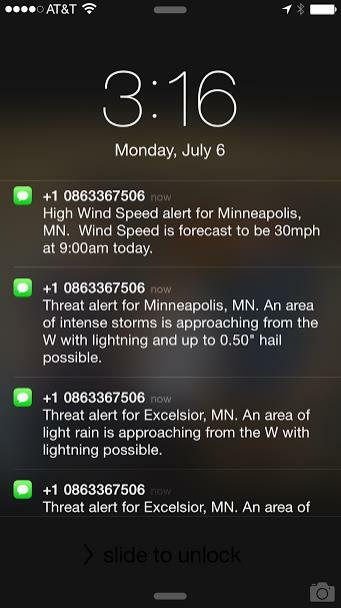 Mortenson also tapped the power of Aeris Enterprise's severe weather alerts, so they could be warned of impending hail, lightning, floods or high winds - or be given a timely heads up that enough rain will fall tomorrow to disrupt a concrete pour or that winds will top 25 mph and tower crane operators may be impacted the day after tomorrow. Exclusive Storm Threat alerts from Aeris Enterprise notify users when heavy precipitation, hail, lightning, strong winds, and even tornadoes are approaching. By tapping the full power of Aeris Enterprise, Mortenson was able to make consistently smarter decisions related to staffing and planning. Aeris Enterprise's exclusive Storm Threat alerts made it possible for managers to be notified of potential severe weather-related problems, long before they became liabilities. M.A. Mortenson is a national, family-owned company headquartered in Minneapolis. They have completed projects for industries ranging from sports stadiums and event centers to hotels and real estate developments.